PCS Note: This is gonna be awesome! LOS ANGELES, CA (April 5, 2019) – BOOM! Studios today announced THE ART (AND MANY OTHER MISTAKES) OF ERIC POWELL, a brand new art book with scandalous tales, family gossip, illegally obtained medical records, behind-the-scenes character designs, sketches, and illustrations from the twisted mind of the creator of the acclaimed series, The Goon, available in stores October 2019. Celebrate an obscene number of years of low art and high art, failure and success, and the many other mistakes of multi-award winning writer and artist Eric Powell! 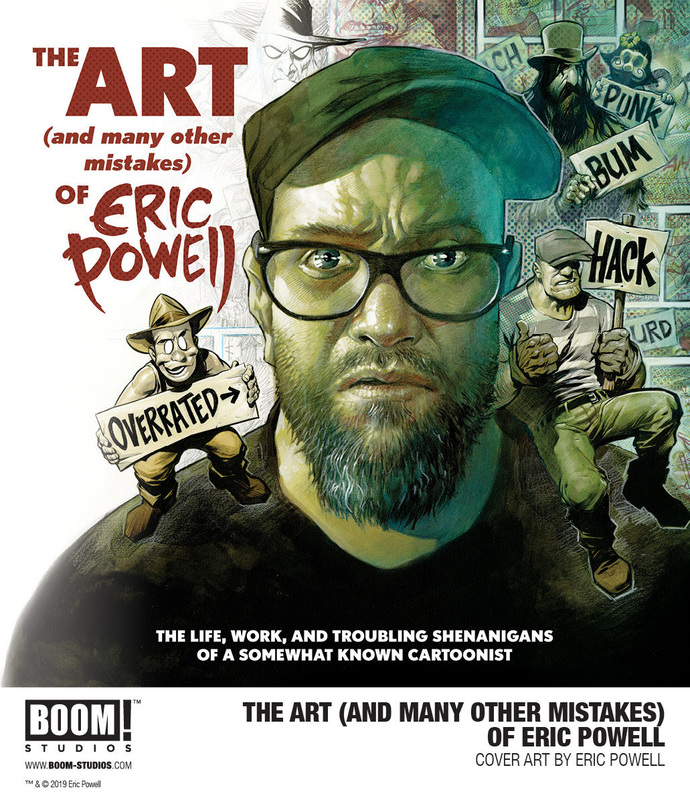 THE ART (AND MANY OTHER MISTAKES) OF ERIC POWELL is the newest release from BOOM! Studios’ eponymous imprint, home to critically acclaimed original series, including Once & Future by Kieron Gillen and Dan Mora; Faithless by Brian Azzarello and Maria Llovet; Abbott from Saladin Ahmed and Sami Kivelä; Bury The Lede from Gaby Dunn and Claire Roe; Grass Kings from Matt Kindt and Tyler Jenkins; and Klaus from Grant Morrison and Dan Mora. The imprint also publishes popular licensed properties including Joss Whedon’s Firefly from Greg Pak and Dan McDaid; Buffy The Vampire Slayer from Jordie Bellaire and David Lopez; and Mighty Morphin Power Rangers from Ryan Parrott and Danielle Di Nicuolo. Print copies of THE ART (AND MANY OTHER MISTAKES) OF ERIC POWELL will be available for sale October 23, 2019 at local comic book shops (use comicshoplocator.comto find the nearest one), October 29, 2019 at bookstores, or at the BOOM! Studios webstore. Digital copies can be purchased from content providers, including comiXology, iBooks, Google Play, and the BOOM! Studios app. For continuing news on THE ART (AND MANY OTHER MISTAKES) OF ERIC POWELLand more from BOOM!, stay tuned to to www.boom-studios.com and follow@boomstudios on Twitter.